Northwest China's Xinjiang Uyghur Autonomous Region lifted 537,000 people out of poverty in 2018, or a year-on-year decrease of nearly half in poverty incidence in the region amid its increasing focus on education in poverty alleviation in recent years. Poverty incidence in Xinjiang has decreased to 6.51 percent, Shohrat Zakir, chairman of the Xinjiang regional government, told the region's annual two sessions on Monday, People's Daily reported. It was 11.57 percent at the end of 2017 and 15.51 percent at the end of 2016, according to the Xinjiang government website. "The achievements indicate a huge progress in poverty alleviation in Xinjiang, which is one of the poorest regions in China," Du Xiaoshan, a researcher at the Rural Development Institute of the Chinese Academy of Social Sciences, told the Global Times on Tuesday. Because the average poverty incidence in China has dropped to 3.1 percent, Du said the region still needs to increase input in the next two years in order to realize the country's 2020 poverty alleviation target to lift all rural residents by then. Two radical approaches to eliminating poverty are education and employment, Du pointed out, which is consistent with the Xinjiang government's measures to deepen poverty alleviation. The regional government has sent 3,000 teachers to southern Xinjiang for preschool education since 2016. The region built and expanded 4,408 kindergartens in 2017 in rural areas, local news portal ts.cn reported on Tuesday. Children gained self-confidence while families felt free to leave their children in kindergartens and went out to work, Kuerban Niyazi, a regional people's congress deputy who attended the ongoing two sessions, told the ts.cn. The region has realized 15-year free education covering three-year preschool education, nine-year compulsory education and three-year high school education in four prefectures in southern Xinjiang, the Chinese Education Information Website reported in September 2017. Xinjiang has been promoting bilingual preschool education further in rural and pasture areas since 2016, reports said. "Bilingual education will not only bring students closer to the outside world with more opportunities, but also prevent them from being affected by extremist thoughts that spread in a closed environment and Uyghur language," Du noted. Free education also largely relieves local families' economic burden, a local official, who used to work in Hotan county, Hotan Prefecture, requesting anonymity, told the Global Times on Tuesday. Apart from school education, the Xinjiang government also launched a three-year plan to provide vocational training to at least 100,000 local residents, according to the website of the Ministry of Human Resource and Social Security. 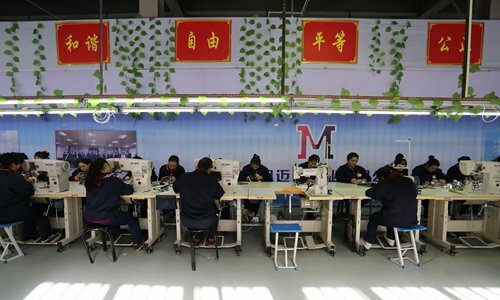 A vocational training center in Yutian county, Hotan prefecture provides a basic monthly salary at 1,500 yuan ($216) plus a bonus to its trainees, most of whom were previously poisoned by extremist ideas. Eli, a trainee who had been at the center for a year, told the Global Times previously that he wanted to learn more vocational skills in the center and started his own business. The Xinjiang regional government invested more than 33.4 billion yuan in poverty alleviation in 2018, 92.3 percent of which went to south Xinjiang, said Zakir. About 75,000 people from poor families in 22 deeply poverty-stricken counties in south Xinjiang have found jobs.